Get close to the iconic Times Square Ball Drop and celebrate this New Year’s Eve in New York City with the incomparable Annual Official Ball Drop Family Party Pass in Times Square. A renowned multi-event pass currently in its 14th year, the Times Square Ball Drop Pass offers you and your family a variety of revelry-filled, family-friendly venues in the heart of NYC’s Times Square, blocks from the famed NYE Ball Drop. Make this NYE with your family unforgettable by basking in the energy of the Times Square Ball Drop and party-hopping your way to the New Year. General Admission tickets to multiple events including entertainment complexes, restaurants, and more. Party hop all night long to sample a variety of venues or stay at one place. Live DJs spinning you and your family’s favorite tunes including Top 40, Hip Hop, Dance. With the Ball Drop Family Party Pass, this New Year’s Eve is sure to be a fun-filled blast for you and your family. Head to the heart of NYE celebration the world over in NYC’s Times Square and revel in the thrilling energy of the Ball Drop while enjoying a host of festive, all-ages New Year’s Eve parties. As celebrants pack in from all over the world to be close to the legendary Times Square NYE Ball Drop, you and your family will have coveted access to the Ball Drop vicinity and the enjoyment of multiple festive and family-friendly NYE parties that will make this New Year’s Eve extraordinary. Usher in the New Year with super-festive, family-friendly events located within blocks of the exciting Times Square Ball Drop. With the top-rated Ball Drop Family Party Pass, you and your family will be able to enjoy activities like bowling and arcade games at a premier entertainment complex, have fun at a world-famous restaurant, or catch a movie and some dancing at a mega cine-plex. Wherever the Ball Drop Party Pass takes you on this NYE night, you’ll be sure to have all the Ball Drop excitement and NYC-only amenities to make this New Year with the family truly amazing. You’ll receive special, highly-coveted access to Times Square’s barricaded areas and, as you party hop to another great Times Square venue, you and your family could catch a view of the historic Waterford Crystal Ball Drop, the centerpiece of NYE celebration world-wide since 1907. A detailed itinerary and venue list will be available shortly. The Ball Drop Family Party Pass has three ticket options with different starting times. Opt for the earlier start time tickets and receive access to more venues so you can choose the best Times Square NYE parties for you and your loved ones. 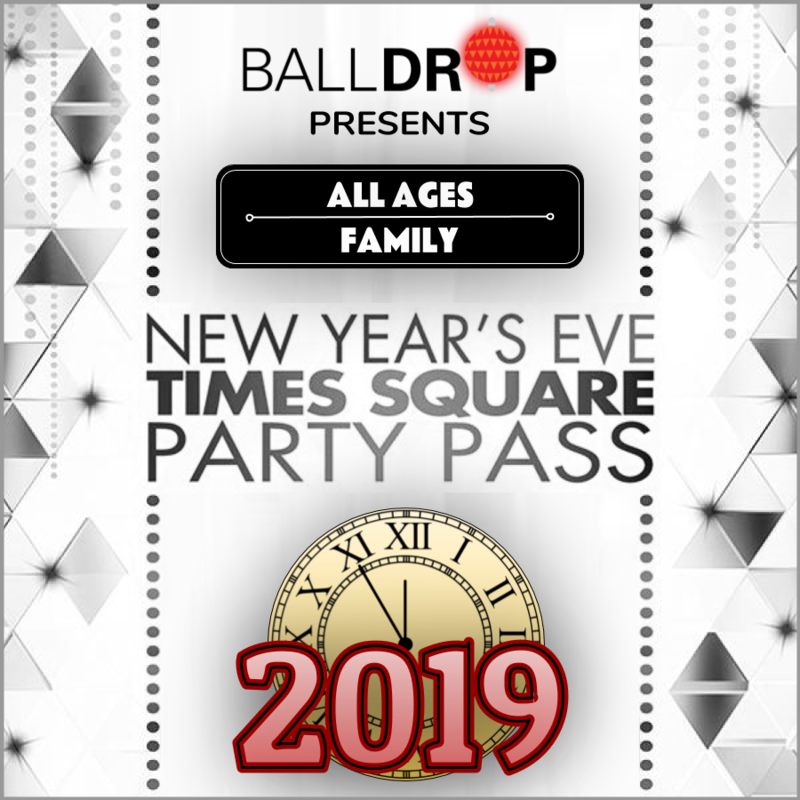 But no matter which ticket you select, this renowned Ball Drop Family Party Pass will include the most coveted family-friendly venues in the Times Square area and all the top amenities and entertainment to make this NYE a blast for everyone in the family. The Ball Drop Family Party Pass not only allows you and your family to get close to the legendary Times Square NYE Ball Drop, it also offers an all-in-one access to a multitude of premier NYE events. Purchased individually, these events would total $1000 in face value, while you can enjoy one or all of them for a fraction of this price value. The thrill of being near the Ball Drop, the excitement of Times Square, and the fun amenities of NYC’s best all-ages NYE parties will make this a spectacular NYE for the whole family. Party Pass tickets are subject to venue capacity rules. If upon arrival at a particular location, the admission line is held and security states that it is temporarily full, you will need to wait until capacity reopens. Make sure you are on the VIP line. Capacity may be deemed full if a large number of guests enter at one time. As the guests settle in, the security staff will reopen the admission lines. The time on your ticket is the entry time into the VENUE. Make sure if you are a Times Square Party Pass holder you enter the Times Square area by 8:30pm. Due to NYPD and TSA crowd control, access to the area is not guaranteed. Your Times Square Party Pass gains you access to Times Square on 12/31/14. Please make sure to have your ticket with you at all times when entering and at each event. You must also show it to Times Square security, if necessary. Access in and around Times Square controlled by NYPD. Please enter events between 7:00PM-11:30PM (depending on event start time) and 12:15AM-2:00AM. Admittance restrictions may be in place during the Ball Drop (11:30PM - 12:15AM). Regardless of admittance time to your party, make sure to enter the Times Square area no later than 8:30pm. Transportation between venues is not included with ticket purchase and is the responsibility of the ticket holder. Times Square is a pedestrian only zone on NYE. A LIVE VIEW OF THE ball Drop is not guaranteed with this ticket. Large crowds are expected and NYPD may prevent access and exiting from venues or street locations during the time that the ball drops.